Philips Hue is the go-to service for smart lighting. It offers a greater variety of products than other services, allowing a lot more flexibility in your home lighting setup. In 2012 Philips launched Hue, one of the earliest examples of smart lighting, allowing for colour and brightness control from a smartphone or tablet. At the time it perhaps wasn't realised how significant this system would become: many have followed, but few have ever matched Hue's abilities or diversity. A number of years on and the system has seen numerous updates and an expansion in what the system offers. What started out as an original starter kit is now a comprehensive range of light bulbs and lights for a variety of different rooms and locations that all help enhance the lighting in your home. What Hue bulbs are there and which should I buy? We've been using Hue since it launched, embracing the changes and growing the system as smart home has emerged. But with growing competition is Hue still worth investing in? Hue is best known for the ability to instantly change colours, with a choice of 16 million available, and a variety of methods to choose the perfect colour for your room, including different 'white' temperatures. You'll need a Wi-Fi router in your home to connect the bridge - the physical brains of the system, if you like, which is a must-purchase - via an Ethernet cable. The bridge creates a ZigBee wireless network to which Hue bulbs can connect. Hue bulbs also create a mesh network, where each can talk to others on the network, meaning that there's no range-based issue from the bridge. Actual control of Hue bulbs is predominately via an Android or iPhone/iPad app (however you can also use a variety of smart switches, voice commands and IFTT rules to control the lights after the original setup). Originally, Philips Hue started with a three-bulb starter kit, costing £180 and giving you everything you needed. That's now dropped to about £150 (£119 on Amazon) and Philips has expanded the offering to also offer bayonet fittings for those in the UK with older light fittings, and GU10 spotlight fittings for those in new-build properties. The regular colour bulbs give off the equivalent of a 60W standard incandescent bulb (when at full brightness), although they are LED, so only draw 10W. They promise to light up your house for the next 10 years. There is plenty of other choice when it comes to choosing the right light bulbs for your room or house. Whether you are looking to replace a downlighter, a standard lamp, or create something moody in the corner, there is a solution for it all within the Hue family. You're not limited to just three bulbs in the starter pack either: you can add up to 50 bulbs to a single setup if you wish. If you're buying second hand, make sure you get the 2nd-gen bridge as this is the one that supports Apple HomeKit and will ensure you're future-proofed. If you don't want Hue bulbs to offer the full colour spectrum, then Hue White provides a more affordable white-only solution. These bulbs were launched as Hue Lux. They still work with the Hue app, but will only let you adjust from warm white to cool white with four pre-programmed settings. Philips says you will want the different whites for different tasks, and that clinical trials have shown that different white light can affect us in different ways; things like improving concentration or your ability to relax. All Hue bulbs can deliver white light, but if it's only white light that you want then Hue White is the best match. Individual White bulbs cost from about £15, but the spotlights are more expensive, at around £30 for a single spot. These white spots are great, however, because they are more compact than the colour versions, so if you have a spotlight bar where the bulbs are exposed, they'll look better. Between the normal colour bulbs and the newer selection of White bulbs, you can cover most of the standard light fittings of your home and across a range of different rooms. But there's more besides. Whether it's the Bloom - which is a bulbous light for up-lighting in the corner of the room - or LightStrips - which are suitable for adding colour under a worktop - the system has matured enough to offer you more than just regular bulbs for your regular light fittings. In recent years, the Philips Hue system has experimented with various form factors that come in the guise of portable battery powered options like the Hue Go - a bedside lampshades with the bulb built-in - to even a range of waterproof outdoor lights for the garden. Then there arethe dedicated light fittings like the new bathroom mirror range that features Hue bulbs built-in and various other 'experiences' that go beyond the traditional bulb. While the app is the predominant way to control Philips Hue, it's not the only way. After all, not everyone will have access to your phone. For that, there are physical switches and dimmers that can be installed too. Tap is a wireless light switch that lets you control Hue presets without needing your phone. Handy if you're trying to not use your phone all the time, you're in a call, or when you have guests around who aren't connected to the system. It doesn't cut out the need for a smartphone, though, as you'll still need that to assign your presets. Tap is around the same size as a standard lightswitch and has one main button and three smaller ones, each of which can be programmed to your needs via the main Philips Hue smartphone app. That means four available presets: one could be bright lighting, the others mood lighting for different occasions. The Philips Hue Tap doesn't come with a battery, because it doesn't need one. Instead it uses kinetic energy - that's the motion of you pressing the switch to transfer that power into performing the task you are after. That means that you can locate the Hue Tap wherever you need it to be, no complicated install required. The only questionable downsides are the £50 price tag and the "kerplunk" sound when pressing the buttons is a little noisy. A similar alternative is the Hue Dimmer, which given its £20 price tag might be a better option for app-free control. The Dimmer will allow you to change the brightness of your Hue lights, as well as turn them on or off - and it's also a remote that you can detach from the wall and take with you wherever you need it. You just have to set it up through the app first. Alternatively you can now get third-party HomeKit physical switches from companies like Eve that will allow you to control the Hue system. There are other shortcuts within HomeKit, too, including assigning Scenes to your lights: press the button and not only will the Hue lights come on but other connected HomeKit devices could spring into action too, if you've programmed it that way. At the core of the system is the app that controls it all, which has evolved over the years. Signing into the app will enable you to access your lights when you're not on your Wi-Fi network, so you can make adjustments when you're out of the house. The app is still broken down into four sections: Home, where you control your rooms or garden; Routines, which allows you to set things like wake up and sleep timers; an Explore area for discovering more with other apps or Hue Labs; and a Settings panel for room/light/accessory setups. Scenes can be used to create the ambiance you want, either by manually tweaking things, or selecting from some presets (like bright, dimmed or nightlight), through to choosing a scene based on pictures. Philips provides some pictures - over a dozen or so like a sunset or beach - but you can also go into your associated device's camera and select something else. Want a Pikachu scene? Just tap on the photo you have of Pikachu and the app will automatically pick out the colours, so you can set your Hue lights to vibrant yellow, with a hint of red. 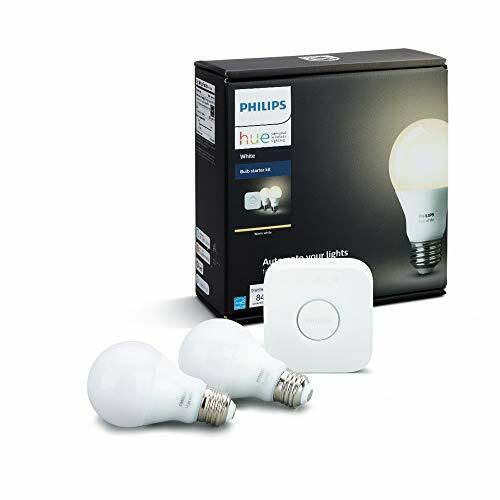 Routines is one of the most popular aspects of having Hue lights because you can use this to turn on the lights automatically and fade them out later in the evening. This is great as a home security measure - and there's also a random option too. The Explore tab really doesn't do much, but it's a nod to the biggest change for Hue over recent years: compatibility with other systems. For those looking to experiment, there are plenty of options, including Philips Hue Entertainment that gives you the ability to get the lights to match the action on a TV screen, immersing you into your movie, show or game more than ever before. If you own a Philips Ambilight TV you can connect your lights to the system allowing you to enhance the experience further. Rather than just rely on you using a smartphone or tablet to control the Philips Hue lighting at home, you can interact and control the experience in a number of other ways, including using your voice. Alexa, Google Assistant, and Siri are all supported, as well as IFTT (If This Then That). The wide range of smart home ecosystem support is second to none and means that regardless of what system you have or change to over time, the Philips Hue system is still likely to be supported. Great examples on IFTT include setting it so the lights turns purple if it's going to rain the next day, or for all bulbs to change colour if someone phones, to using the lights as night lights for the kids to go to sleep with them slowly dimming over time. Simple things like turning the lights on automatically an hour before sunset, turning the lights off at midnight, and so on, make the rules much more useful than just a lamp that's on a timer. The system is still growing and adapting too. Philips Hue has confirmed it will support Siri Shortcuts, allowing you to say, for instance, "Hey Siri, let's go to bed" to trigger your Hue smart home lights to fade off while also triggering some night-time music to play through your phone or through an AirPlay speaker. Saying, "Hey Siri, it's Saturday" as you wake up, could turn your lights on and send your friend a text to let them know you're free. The possibilities, as they say, are endless. When Philips Hue first launched, its competition wasn't really a factor. Now there's a lot more competition - Hive, Osram, Ikea, Elgato, Belkin, Lifx and others all have lighting systems - but no other manufacturer has quite managed to gain as much ground or have as expansive an offering as Philips. Some will argue the colour element is a gimmick, but we've found ourselves using it plenty of times to set the mood or tone in a room. If you've got lots of Philips Hue lights in a room you can really paint a scene, especially if you have white walls. The biggest downside is that the Philips Hue system isn't cheap, and while the White system seems like a more affordable route to dabble in, it still adds up fast. As the Hue system has grown and expanded, it now offers a very comprehensive ecosystem. No other smart lighting system offers the depth and breath of Philips Hue. Five years into using it and we continue to grow our system and use it daily - and that we feel, is high praise indeed. This review was first published on 5 August 2014. Hive added lights to the connected thermostat giving you another string to the Hive home. The selection is a little basic at the moment though. Aiming to undercut Hue, Lightify has a gateway that doesn't need to be connected to your router, along with a wide selection of bulbs, from colour-changing to candle to light strips. Lightify is Hue's biggest competitor, although Hue's reach into other products is a little stronger.